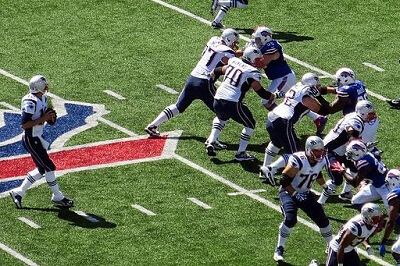 Get notified when New England Patriots tickets are available! Established in 1956, the New England Patriots are an NFL team in the American Football Conference East. The team won their first Super Bowl in 2001 and had back-to-back wins in 2003 and 2004. The New England Patriots play home games at Gillette Stadium, which is found in Foxborough, Massachusetts, a town about 20 miles from Providence, Rhode Island, and 25 miles from Boston, Massachusetts. The stadium opened in 2002 and can hold roughly 66,000 fans on game day. You can be one of the ones in the stadium cheering on the Pats by purchasing your New England Patriots tickets online with the help of the links above.